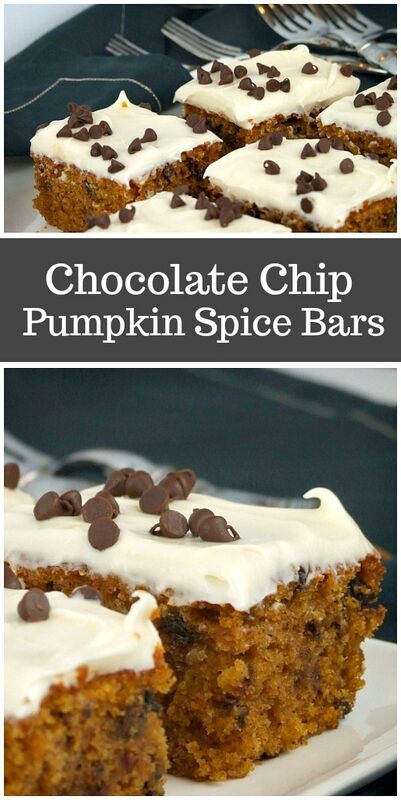 This recipe for Chocolate Chip Pumpkin Spice Bars is a good recipe to make if you’re on the hunt for a fall dessert to feed a small crowd! The first time I made these, I brought them to a teacher’s luncheon at my son’s elementary school. It was the perfect dessert to bring for a teacher lunch because there are loads of teachers, and this recipe makes a lot! 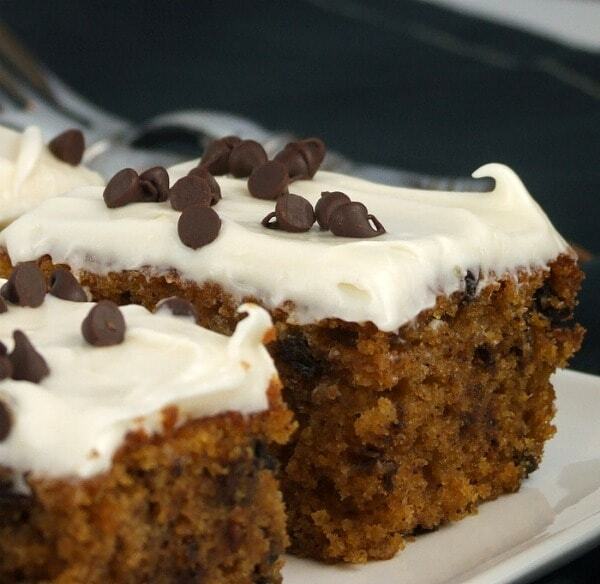 You’ll want to use a fork to consume these Chocolate Chip Pumpkin Spice Bars. You can see from the photo that they’re really rather more like a cakey-bar than a hold-in-your-hand-and-firmly-grasp-it kind of bar. But you can also tell from the photo that these are incredibly moist (happily so). 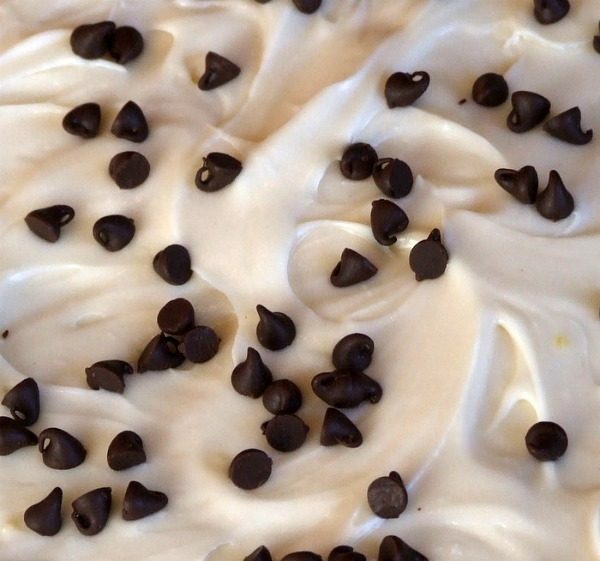 Cream cheese frosting tops these bars along with those darling little mini chocolate chips. 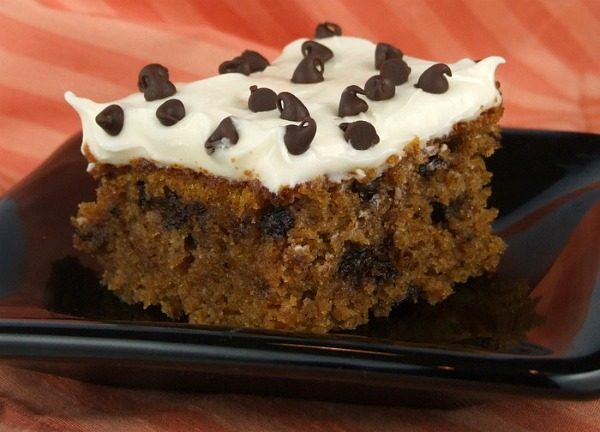 The chocolate chips are also spotted throughout the cakey bars, adding a subtle chocolate flavor. The teachers at my son’s school were so happy with this fall treat. Despite the fact that the treat came equipped with a little sign announcing its name, the teachers thanked me for the delicious carrot cake I brought them. I suppose it’s reminiscent of carrot cake in its appearance with the cream cheese frosting and similar spice additions, but you can definitely detect the pumpkin flavor without difficulty! 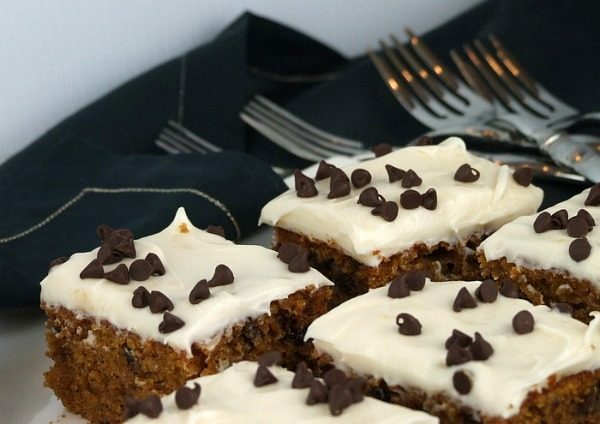 Hope you enjoy these delicious Chocolate Chip Pumpkin Spice Bars. They’re a delicious dessert to make during the fall months! If you’re looking for more fall desserts, you might also enjoy my Cran-Apple Raspberry Bars and this Pumpkin Cheesecake. Caramel Apple Upside Down Cake, Pumpkin Delight, and Autumn Spice Cake are good fall dessert choices too! This recipe feeds a small crowd... a small, crowd of pumpkin spice bar lovers! Preheat the oven to 350°F. Spray a 10x15-inch baking pan with nonstick spray. In a large bowl, whisk together the pumpkin, oil, eggs and sugars until combined. In a separate bowl, whisk together the flours, baking powder, cinnamon, baking soda, salt, ginger and cloves. Toss in the mini chocolate chips and stir to combine. Add the dry ingredients to the wet and stir until moistened. Pour the cake batter into the prepared pan. Bake until the center springs back when lightly pressed in the center- 25 to 30 minutes. Remove and place on a wire rack to cool completely. In a large mixing bowl, beat together the cream cheese, butter, milk and vanilla. Slowly add the powdered sugar, 1 cup at a time, and mix until smooth. Frost the bars and sprinkle with additional mini chocolate chips. OMGosh, this looks fantastic! Since I do desserts for the family gathering this sounds like a great way to use the traditional pumpkin in a slightly different way. 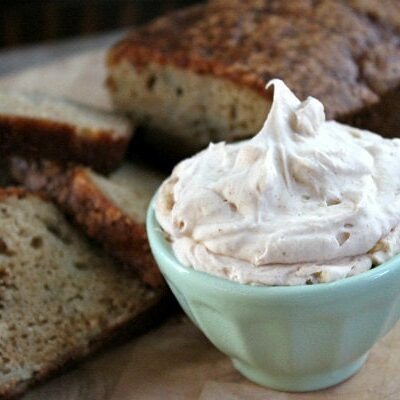 2 questions – can white flour be used without any wheat flour at all and can I puree the canned pumpkin from the store? Hi! 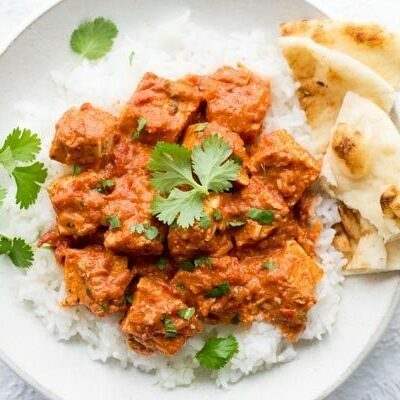 I think this recipe looks amazing! I would love to try it, however I have not seen whole wheat pastry flour in my local stores – is whole wheat flour the same/an acceptable substitute? Thank you!! Sorry to be dense, but when you call for a 10×15 pan, do you mean like a jelly-roll pan or like a 9×13, but bigger? I was going to make these tonight, but I’m not sure what to cook them in. I have a jelly roll pan, but not one with deep sides. Yes, a jelly-roll pan. 1-inch sides work well. 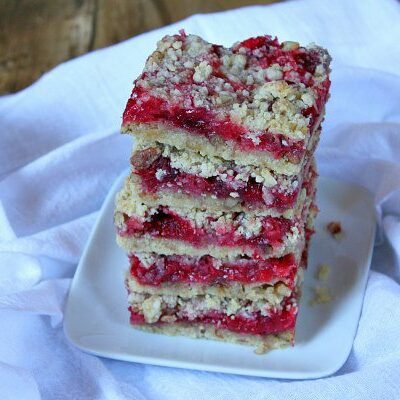 I’ve made a recipe very similar to this and had a cinnamon/sugar topping, mmmmm. Now I need to try it this way, with frosting! I made these for Thanksgiving and they were a huge hit! For the frosting I used 2 tablespoons of milk instead of 2 teaspoons; also reduced the confectioner’s sugar to 3 cups. I couldn’t find a 10×15 pan so used a 10×17 lasagne pan and cooked it for the minimum time suggested. Came out very moist and flavorful. Just made these, I found you through SMS Handmade Holidays. I actually had to substitute some sweet potato for the pumpkin as I use fresh pumpkin I’ve canned and frozen and only had about a cup thawed and ready to go. So I mixed in some leftover mashed sweet potatoes from supper the other night and the batter tasted great! They are cooling now, but I can’t wait to frost them up and eat one! Cannot think of anything better than pumpkin and chocolate! 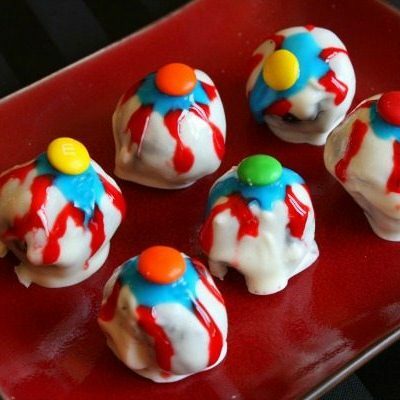 I can’t wait to bake this, along with all of those other fun treats on your blog for halloween! I loved this recipe! I actually liked the bars better warm, without the frosting. The frosting also made a lot more than I needed, I only ended up using 1/2 the frosting. Great fall recipe. I’ve included this in my round up! I love your recipes. They all look so good. thank you for your heavenly recipes. I stumbled upon via blogger. Glad I did!